No posts for this year. September 2012. 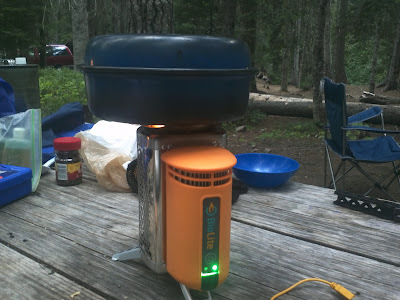 Taking my new camp stove out for a test drive this summer was a real delight. Biolite has created something simple, elegant, and revolutionary. 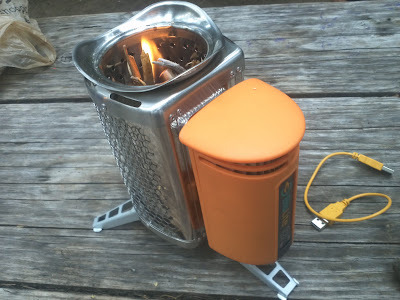 Its camp stove requires no white gas or propane, and not only generates a great cooking flame but also serves as a charging station for all your USB-rechargable devices. Fuel is expected to be small twigs and branches, essentially typical forest underbrush. You depart on your camping trip with the stove battery fully charged. From there each use of the stove will recharge the battery for the next use, thus boot strapping you for the duration of your trip. During your trip, once you have the stove going, you can plug in USB devices to recharge them, keeping them fully charged and functional no matter long you're "off the grid." And the only fuel you'll need during the trip will be twigs and small branches that you can easily forage from the forest underbrush along the way. 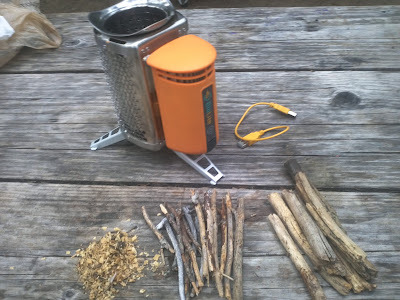 So unless you're doing high alpine or desert camping, the Biolite stove is a fantastic option. It eliminates the need to pack fuel with you, and provides a means for recharging key devices. Let's look at the stove in action to see how you start it up and use it. Here I have everything laid out on the picnic table in our camp site: stove, USB cable, and three groups of twigs including some sawdust I found lying around, some small twigs, and some small sticks. Note that the small sticks actually turned out to be too big to be useful. Here I've put the sawdust in the bottom of the fuel chamber, put a few small twigs on top, and lit this on fire. This is really no different from how I'd start a regular camp fire; I'm just doing it in the stove chamber instead of a fire pit. Here you'll note that I've started the stove fan. You press the start button once for low fan speed, press it a second time for high fan speed, and press and hold down to turn the fan off. Initially it is on low speed. There are two indicator lights, one of the left, and one on the right. The left indicator light is lit, indicating low speed. Note also that the light is orange, and that the horizontal indicator light above the USB slot is also orange. This indicates that the battery is currently draining, and there isn't enough heat to generate power for USB charging. After a few minutes the temperature has risen enough for cooking. Here I have the fan set to high (the right indicator light is on), and excess power is being generated (the indicator lights are green). I have 2 quarts of water on to boil here, and time to boil was comparable to what it would be with a similar sized gas stove. Dinner is done, and now I'm re-charging our Nook Color. The BioLite stove is a little expensive up front, currently listed at $129. And it did take some time to receive mine (it was several weeks between order and arrival time). Still, this is an outstanding value and a bit of outdoor technology well worth investing in. A comparable gas stove might be in the $80 range, and then you have to both buy fuel for it and pack fuel with you. For serious backpackers in most of the U.S. the BioLite will be a godsend, eliminating both the weight and pack space of a fuel canister in addition to a stove. 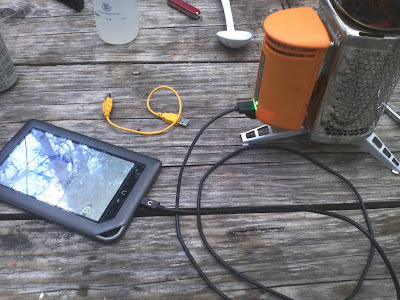 The BioLite also enables you to use your tablet, eReader or smart phone to access an entire archive of books and photos without having to worry about running down the battery on said device. 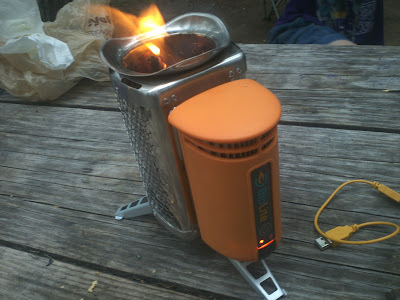 The BioLite stove is the most innovative piece of gear I've added to my camping kit in a long time.